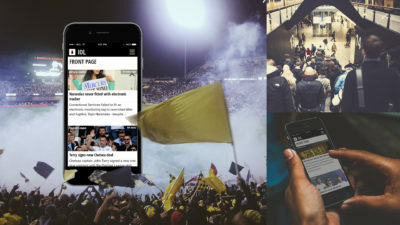 South Africa’s largest English language print media company, Independent Media, needed to provide a more cutting-edge experience for smartphone users of the IOL online news site. Critical global research was conducted on the browsing behaviour of online news readers as well as the current performance standards of news platforms. After finding a direct correlation between increased web traffic volumes and page loading times, the decision was taken to redevelop IOL Mobile for speed, with faster page loading times than competitors. Combining their expertise, Saratoga was tasked with creating an industry leading news browsing service for mobile. At the time, the first of its kind to enter the mainstream South African mobile news industry, IOL mobile was developed as a single page app. – Speed was boosted with pre-fetching. – This development function enabled IOL Mobile to load an article containing the piece’s most important content instantaneously. – The article was then replaced with the ‘real’ article as all the finer details loaded successfully in the background. – Pre-fetching provided the user with a comprehensive and uninterrupted experience. – Aggressive, site-wide caching optimisation provided further improvements to the site. Pages on IOL Mobile loaded three times faster. – Mobile users increased by 67%, to 1.4 million users. – Pages per session increased by 25%. – Sessions increased by 85%. – Independent Media was named the winner of the 2015 Global Innovation Award for the Africa region at the International News Media Association’s (INMA) awards ceremony in New York, with IOL Mobile forming a key part of the award submission. – Walter Madzonga, Group Executive: Digital, Independent Media. *Video for case study created by World Wide Creative. © Copyright Saratoga 2000 - 2018. All Rights Reserved.